Charles Dickens’s last completed novel was Our Mutual Friend; it was serialized into twenty parts between 1864 and 1865. Our Mutual Friend has been hailed (in many a book blurb) to be a paradigmatic shift in Dickens’s writing; it would bring a new age and development, so to speak, in English literature. Unfortunately, we can never know this because Dickens died whilst writing The Mystery of Edwin Drood, Dickens’s take on the mystery novel. In a friendly rivalry, he was trying to show Wilkie Collins what a mystery looked like–Collins’s famously wrote The Moonstone (it’s pretty good), TS Eliot claimed that Collins, here, invented detective fiction (throwing shade on Edgar Allan Poe). 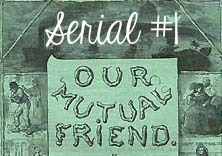 But, let’s return to Our Mutual Friend (OMF). OMF begins on the cold River Thames, with a young girl and father in small boat that easily could be overturned in the waves. The young girl persists, against her father’s demand, in rowing the boat because she does not want to be next to the body. The dead body. The characters, aside from the body, sweep the river to find flotsam and jetsam–collecting what they find and pocketing what they may. Who is the dead body? Well, we will have to wait before we find out. In the following chapter, we are introduced to the Veneerings–a couple who are entrenched in polite society. Obviously they are new money, their furniture isn’t old stock, it is new, covered with the fresh veneer of ready money. Dickens doesn’t relent with this pun, and he introduces their entrance into society, a Mr Twemlow, as a table–filled with many leaves. Twemlow is important to them because he provides their access to society, to the right types of people, and the right connections; but he is paraded like an expensive, well-laid, set of furniture, collected and displayed when one must impress. The Veneerings are throwing a fancy dinner party, with the usual incompetents present and two lawyers, who absolutely hate their profession. A young boy brings news to the party and to one lawyer in particular–Mr. Mortimer Lightwood–that a body has been found. Who is the body, one might ask? Well, the rich are always in the know, aren’t they? *taps nose knowingly* It is the body of the young man that Mortimer had just been discussing, as polite gossip, at the dinner party. His father, a rather unlikeable but wealthy man of the Dust industry (laugh again). Dickens’s humorous narrative style informs us that the father disowned both of this children, his daughter for not marrying the right man and his son for defending the daughter. The son jumps ship, literally, and goes to the Cape to make wine. The father dies, in the meantime, and leaves his estate and money to his son, on the condition he marries a girl (we know not yet who). There is a provision in the will for a servant of the household. Should the son not followthrough with his dead father’s matrimonial wishes, the servant will inherit all. All are convinced that the man found, John Harmon, was murdered. But there is no concrete evidence to point at any guilty party. The money he travelled with is missing. He does not have any identification on his person, but is identified by the ship’s captain, the same ship off of which he fell. But Dickens does not disappoint. Bella Wilfer is said matrimonial conditional bride that would direct the Dust funds into Harmon’s dead pockets. She is depicted as a hysterical woman, biting her hair and acting outrageous. Despite this trope-ish depiction of a young, unmarried, and, therefore, hysterical woman, Bella is astutely able to describe the perils of being poor and the unbearable, prison-like sentence poverty casts upon its bed fellows. A plot twist is born. A young man arrives to rent the front room from the Wilfers. A young man who bears a startling resemblance to the dead John Harmon. Indeed, there are other characters to touch upon, such as the family who finds John Harmon, Gaffer, Lizzie, and Charley Hexam–father, daughter, and son, respectively. But, I will save them for later serial section. There are 20 divisions of OMF, so I will be following that structure. Instead of breaking down the plot for each section, I will likely do something creative in response to what I have read. If I feel I have to explain a plot section, I will append a little summary.